The National Research Council has recently issued three reports on climate change, and what actions the U.S. should consider in light of these findings. The National Research Council is the operating arm of the National Academy of Sciences and National Academy of Engineering. The reports basically reinforce that the state of climate change science is strong. The reports further emphasize that more research is needed to understand exactly why climate change is occurring, when and where the most severe impacts will occur, and what the best response would be to climate change. There is a strong, credible body of evidence, based on multiple lines of research, documenting that climate is changing, and that these changes are in large part caused by human activities. While much remains to be learned, the core phenomenon, scientific questions, and hypotheses have been examined thoroughly and have stood firm in the face of serious scientific debate and careful evaluation of alternative explanations. This report reviews the current scientific evidence regarding climate change and examines the status of the nation’s scientific research efforts. It also describes the critical role that climate change science, broadly defined, can play in developing knowledge and tools to assist decision makers as they act to respond to climate change. The report recommends a number of actions to advance the science of climate change — a science that includes and increasingly integrates across the physical, biological, social, health, and engineering sciences. (2) The nation needs a comprehensive and integrated climate change science enterprise, one that not only contributes to our fundamental understanding of climate change but also informs and expands America’s climate choices. The report recommends that a single federal entity or program be given the authority and resources to coordinate a national, multidisciplinary research effort aimed at improving both understanding and responses to climate change. In addition, the U.S. should deploy a comprehensive climate observing system. Vulnerabilities to climate change impacts exist all across America and differ by region, sector, scale, and segment of our society. Consider, for example, the likelihood of reduced surface water supply in America’s West because of reduced snowfall and snowpack in the western mountains and, at least in the Southwest, prospects for reduced total rainfall. Options for adapting to the prospect of more severe water shortage in the West and Southwest include improving efficiencies in water use, reducing the need for water for competing purposes (e.g., power plant cooling), finding ways to reduce evaporation from reservoirs, learning more about potentials and limits of groundwater withdrawal, increasing mechanisms for inter-basin water transfers, revisiting approaches to water rights, and developing technology for affordable desalination of sea water. While it is difficult to know precisely the impacts that will occur in the future, adaptation offers a way to prepare and minimize the risks to social, economic, and natural systems associated with these impacts. Given the diversity of climate impacts, vulnerabilities, and available adaptation options across the United States, the report concludes that adaptation planning and action will be required across all levels of government as well as within the private sector, non-governmental organizations (NGOs), and community organizations. Accordingly, this report outlines a framework which engages decision makers across all levels of governance and across public and private entities through the development of a national adaptation strategy. Within this national strategy, the federal government plays a unique and critical role in providing technical and scientific resources that are lacking at the local or regional scale, reexamining policies that may inhibit adaptation, and supporting scientific research to expand our knowledge of impacts and adaptation. energy sector would consume the domestic emissions budget well before 2050. The report states that a carbon-pricing system is the most cost-effective way to reduce emissions -- either cap-and-trade, carbon taxes on emissions, or a combination. There must also be an emphasis on increasing energy efficiency; accelerating the development of renewable energy sources; advancing full-scale development of new-generation nuclear power and carbon capture and storage systems; and retrofitting, retiring, or replacing existing emissions-intensive energy infrastructure. This project was requested by Congress and is funded by the National Oceanic and Atmospheric Administration. For more information, visit http://americasclimatechoices.org. The National Academy of Sciences, National Academy of Engineering, Institute of Medicine, and National Research Council are independent, nonprofit institutions that provide science, technology, and health policy advice under an 1863 congressional charter. Committee and panel members, who serve pro bono, are chosen by for each study based on their expertise and experience and must satisfy the Research Council's conflict-of-interest standards. The resulting consensus reports undergo external peer review before completion. For more information, visit http://national-academies.org/studycommitteprocess.pdf. 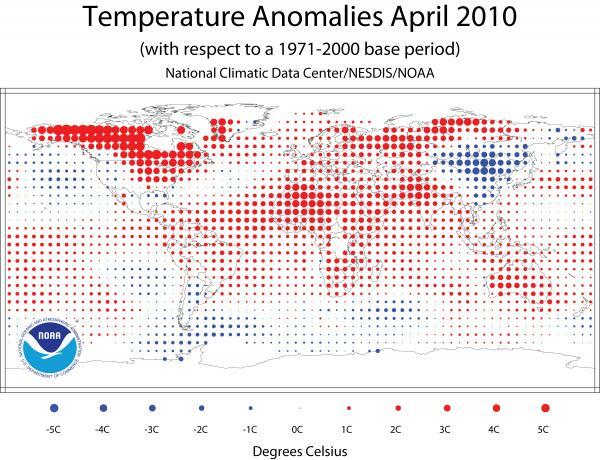 April 2010 was characterized by very warm conditions across much of the world. Warmer-than-average conditions during April 2010 were present across much of the world's land areas. The warmest anomalies occurred in southern Asia, northern Africa, the north central and northeastern U.S., Canada, Europe, and parts of northern Russia. * The combined global land and ocean average surface temperature for April 2010 was the warmest on record at 14.5°C (58.1°F), which is 0.76°C (1.37°F) above the 20th century average of 13.7°C (56.7°F). This was also the 34th consecutive April with global land and ocean temperatures above the 20th century average. * The worldwide ocean surface temperature was 0.57°C (1.03°F) above the 20th century average of 16.0°C (60.9°F) and the warmest April on record. The warmth was most pronounced in the equatorial portions of the major oceans, especially the Atlantic. * The April worldwide land surface temperature was 1.29°C (2.32°F) above the 20th century average of 8.1°C (46.5 °F)—the third warmest on record. * For the year-to-date, the global combined land and ocean surface temperature of 13.3°C (56.0°F) was the warmest January-April period. This value is 0.69°C (1.24°F) above the 20th century average. Trees and other plants help keep the planet cool, but rising levels of carbon dioxide in the atmosphere are turning down this global air conditioner. According to a new study by researchers at the Carnegie Institution for Science, in some regions more than a quarter of the warming from increased carbon dioxide is due to its direct impact on vegetation. This warming is in addition to carbon dioxide's better-known effect as a heat-trapping greenhouse gas. For scientists trying to predict global climate change in the coming century, the study underscores the importance of including plants in their climate models. The scramble to find sufficient land for biofuel production has experts eyeing marginal croplands that have been placed in the Conservation Reserve Program (CRP). Now a study by USDA Agricultural Research Service (ARS) scientists indicates that plant species diversity and composition are key factors in potential energy yield per acre from biomass harvested from CRP land. The team studied plant species composition, species diversity, aboveground biomass, plant chemical composition and potential ethanol yield at 34 warm-season grassland sites across the major ecological regions of the northeastern United States. The sites were a mix of CRP holdings, wildlife refuges, state parks and other public and private lands. The researchers identified 285 plant species, most of them native, on the study sites. Switchgrass, big bluestem, and Indiangrass, which are all tall native prairie grasses, dominated the vegetation mix. There was an average of 34 different plant species per quarter-acre. The WCI, RGGI and MGGRA released a joint paper outlining a “common vision” for an offset system. The white paper – drafted by officials from the Regional Greenhouse Gas Initiative (RGGI), the Midwestern GHG Reduction Accord (MGGRA), and the Western Climate Initiative (WCI) – outlined broadly what might constitute a high-quality offset program that could span the regions. The paper marked the first collaboration by the participating jurisdictions as they aim to unify their programs and inform future federal programs in the U.S. and Canada. “A potential benefit of uniformity is that purchasers of offsets will have greater confidence in the value of the offset, and suppliers will find it easier to meet a consistent set of standards,” officials said in a joint statement. It would also be a boost to the market, since jurisdictions could accept offsets used elsewhere. The officials agreed that emissions reductions achieved through offset projects must be “real, additional, verifiable, permanent, and enforceable”. They also agreed that any offset program should be based on uniform standards, not a case-by-case review of specific projects, the paper said. Offset programs must also have adequate transparency, credible verification, and administrative flexibility. The three programs are in different stages of development, with RGGI up and running, the WCI moving steadily toward a 2012 start date, and the MGGRA evaluating whether there is the political will among its members to move forward. Starting next year, the U.S. Environmental Protection Agency rules would require large power utilities, manufacturers, and oil refiners to get permits to operate or prove they are using the latest green technology to cut emissions when building new capacity. The EPA is effectively trimming the Clean Air Act, or "tailoring" it, so it only applies to the biggest emitters of gases blamed for warming the planet. Without the tailoring, small emitters such as hospitals and schools would be regulated and overwhelm the agency with paperwork. The rules would subject power plants, factories and oil refineries that emit 75,000 tonnes of carbon dioxide equivalent and already under clean air regulations to get operating permits beginning in January 2011. Regulated polluters would include big coal-fired power plants and heavy energy users such as cement, glass and steel makers. Waste landfills and factories not already covered by clean air laws that emit at least 100,000 tonnes of greenhouse gases a year would get a six-month extension and would not be regulated until July 2011. Sources that pollute less than 50,000 tonnes per year would not be regulated until 2016, if ever, said EPA air official Gina McCarthy. Under the rules, polluters would have to get permits showing they are using the best available technology to cut emissions when building new plants or modifying existing ones. Senators John Kerry and Joe Lieberman last week unveiled their 987-page American Power Act, which calls for a 17 per cent GHG reduction below 2005 levels by 2020. While the bill got the early endorsement of some major utility and energy companies, it was panned by environmental groups for its provisions to expand offshore oil drilling. The bill’s path forward has been complicated by a number of factors, including a major oil spill still unfolding in the Gulf of Mexico and a political row over immigration reform. Senator Lindsey Graham, a Republican who helped coauthor the American Power Act, cited those two reasons for backing off supporting the bill for the time being. Since not all Democrats support passage of the bill, such as those from coastal states that oppose offshore drilling, the support of Republicans is seen as vital. The bill will need the support of at least 60 senators if it is to pass the chamber. Democrats currently control 59 seats with Republicans occupying the other 41 seats. Meanwhile, a critical economic analysis of the Senate climate bill by the Congressional Budget Office (CBO) has begun. The CBO is a nonpartisan government agency that conducts economic analysis of federal policy. Results of the office’s analysis will shape the debate over the legislation and its impact on the U.S. economy. If the CBO analysis concludes the cost of reducing U.S. emissions and reliance on fossil fuels will come at a modest cost, it could improve the bill’s chances of passing. But if the CBO finds the bill will impose a high financial burden on consumers, especially middle class families, it will give ammunition to the bill’s opponents. The Environmental Protection Agency (EPA) and the Energy Information Administration (EIA) are also examining the Kerry-Lieberman bill. Their reports are expected to be released next month. In 2009, energy-related carbon dioxide emissions in the United States saw their largest absolute and percentage decline (405 million metric tons or 7.0 percent) since the start of the U.S. Energy Information Administration’s comprehensive record of annual energy data that began in 1949. While emissions have declined in three out of the last four years, 2009 was exceptional. Emissions developments in 2009 reflect a combination of factors, including some particular to the economic downturn, other special circumstances during the year, and other factors that may reflect persistent trends in our economy and our energy use. The main reasons for the decline in 2009 were a fall in the per capita gross domestic product (GDP), the energy intensity of the economy, and carbon intensity of the energy supply. The three factors combined in roughly equal proportions to cause emissions to fall. The use of renewable and nuclear energy sources also contributed to the fall in emissions. The avoided emissions from new wind capacity, natural gas efficiency improvements, and nuclear improvements made since 2000 meant about 147 million fewer tons of CO2 were emitted in 2009 than would have been the case had these changes not occurred, the EIA stated. The EIA stated it expects CO2 emissions to rise again as the economy recovers. * Hear from Mark Nechodom, Deputy Director for the Office of Environmental Markets in the U.S. Department of Agriculture about the role that these workshops will play in shaping federal policy. * Discuss path(s) to market for GHG emission reductions and carbon sequestration. * Learn about the market tools and quantification methods needed to bring agricultural carbon to market. * Participate in an interactive agricultural carbon trading simulation exercise. Four workshops are being held across the U.S. as part of a capacity-building effort among the agriculture sector, carbon market, research, policy, and investment stakeholders. The sessions will be interactive and practical. Agriculture has the opportunity to play a major role in addressing the challenge of climate change. Financial incentives for farmers to produce emission reductions or to sequester carbon can help unleash this potential. One market tool that policy makers have been using successfully in other sectors — carbon markets — are beginning to be applied to agriculture in some jurisdictions. Any such system of financial incentive however, must achieve the intended environmental outcomes and work for both agricultural producers and potential investors. The “Market Mechanisms for Agricultural Greenhouse Gases” (M-AGG) is one of three initiatives, along with C-AGG and T-AGG, in building capacity for further activity in carbon market infrastructure development in both the short and long-terms. In the short-term, this project aims to provide greater context, link initiatives, and engage a broader stakeholder group. Over the longer-term, we hope to build broader market capacity towards eventual rule-making processes under the USDA and/or US EPA (or regional initiatives).